Golden Text: “To the angel of the church in Philadelphia write: These are the words of him who is holy and true, who holds the key of David. What He opens no one can shut and what he shuts no one can open” (Rev. 3:7 NIV). The above passage of Scripture is referenced, “To the angel of the church in Philadelphia”. Christ holds the key of David, which means Christ holds the key of the House of David. He only holds the key of authority. He has the key of knowledge in the Scriptures, and he gives his ministers light and knowledge in the doctrines of the Gospel. Christ declares, “I have given you the keys of the Kingdom of Heaven. Whatever you bind on earth will be bound in heaven, and whatever you loose will be loosed in heaven” (Matt. 16:19 NIV). Keys lock and unlock doors. Christ opened the door of heaven by his blood and his righteousness. He gives us the liberty and boldness to enter into the Holy of Holies, to stand before the presence of God. Yet, he has authority to shuts up the Scriptures and prevents the eyes of the natural man from seeing what is in them. Without faith in Christ the door to heaven is shut (John 3:18). Our prayers are based in our relationship with God. Prayer places us in direct contact with Him. Prayer is the key that we use to invite God into our situations, and we are then able to ask Him to work on our behalf. He has given us the authority to bring heaven on earth using prayer as the vehicle. When we pray, our prayers are to be in line with God’s will. Nothing on earth is done without God’s permissive will. The Bible clearly reveals to us what the will of God is. The things that we pray about, or pray for, are to bring honor and glory to God. Jesus taught his disciples how to pray in Matthew 6:5-15; please note that this is not a formula for praying, but “a model for praying”. Essentially we are to pray in accord with what He wants to be done. “What you bind on earth is already bound in heaven”, (Matt. 16:19; 18:18). Jesus in heaven looses the authority of His word as it goes forth on the earth for the fulfillment of its purpose. We know that prayer has changed the lives of every believer and we are the living proof that God hears and answer our prayers. The passionate prayers of the righteous can accomplish much. We show our love for others by praying for them. This is in line with the new command Jesus gave us. ” A new command I give you; Love one another. As I have loved you, so you must love one another” (John 13:34). Our prayers are for those who are suffering various illness, trials and tribulations, as well as for those who are less fortunate. We are to have a heart to pray for the unsaved and those who are lost. We are to also pray for our government and our leaders. 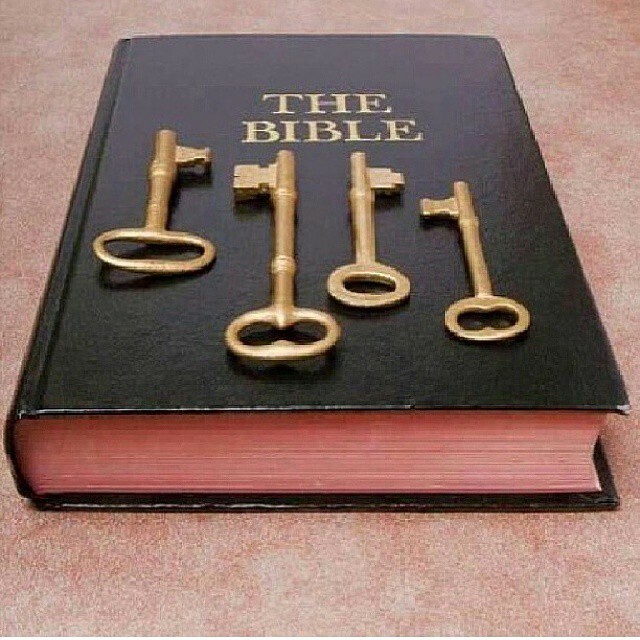 The Bible is filled with keys of wisdom that provides us with godly information for living a successful live. If any of us lack wisdom, we are to pray for wisdom as well (James 1:5). And just in case you don’t know what to pray Jesus and the Holy Spirit are intercessor, they intercede continuously on our behalf. Never underestimate to power of prayer. God is the power behind all of our prayers. He is able to do exceedingly, abundantly, above all that we may ask or think. He invites us to ask, seek, and knock and he promises that the door will be upon unto us. The atoning sacrifice that Jesus made on our behalf has given us daily access to the throne of grace. Jesus is the only way to the Father. Salvation is found in no one else (Acts 4:12). If you have not received salvation, Romans 10:9-10 states, “If you confess with your mouth, “Jesus is Lord,” and believe in your heart that God raised him from the dead, you will be saved. For it is with your heart that you believe and are justified, and it is with your mouth that you confess and are saved. My prayer is that you pray and confessing Jesus as your Lord and Savior, while believing in your heart that God raised him from the dead. If you believe this and have prayed about it, you have just received eternal salvation in the name of Jesus Christ. May God bless you and keep you safe always. Amen. What’s Perfect About the Number Seven?